The weapons inspectors will be back at the United Nations this morning, reporting to the Security Council on whether they believe Iraq is complying with U.N. resolutions on disarmament. And while President Bush won't be in New York as the inspectors deliver their report, he's already set the stage for that event. At a rare prime time news conference at the White House last night, Mr. Bush - preparing Americans for the possibility of war - said the U.S. will drive Iraqi President Saddam Hussein from power if it comes to war in Iraq - with or without support from France, Germany and other skeptical allies. "It's time for people to show their cards and let people know where they stand in relation to Saddam," said Mr. Bush. President Bush said he had not decided whether to invade Iraq but that it was only a matter of days before a U.N. Security Council vote on a U.S.-backed resolution authorizing force. "Our mission is clear in Iraq," the president said. "Should we have to go in, our mission is very clear: disarmament. It will mean a regime change. No doubt there's risks in any military operation. I know that." Mr. Bush insisted that he had not decided whether to invade Iraq and said it was up to Saddam: "It's his choice to make whether or not we go to war. He's the person that can make the choice of war or peace. Thus far he's made the wrong choice." The U.N. Security Council is to hear today from chief weapons inspector Hans Blix and his counterpart, Mohamed ElBaradei - both reporting on Iraq's measure of cooperation in eliminating its banned weapons. Their assessment could weigh heavily in determining the outcome of the Security Council's vote on a resolution to authorize force. 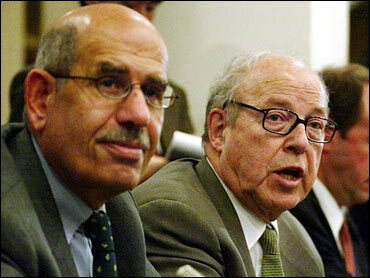 In an interview with The Associated Press Thursday, ElBaradei, the chief nuclear inspector, said, "In my area, inspection is working. We are making progress. There's no reason to scuttle the process." Blix, too, has said Iraq is cooperating more than it has. Arriving in New York last night for today's U.N. meeting, China's foreign minister said his government's position against military action in Iraq is unchanged. "The majority of countries in the world stand for a political solution, and the opposition to war is prevailing," said Foreign Minister Tang Jiaxuan. He reiterated support for a joint statement issued this week by France, Russia and Germany opposing any U.N. resolution authorizing force against Baghdad. Tang stopped short, however, of saying that China itself would actively block the resolution. And he called on the international community to urge Iraq to both cooperate with weapons inspectors - and do so more willingly. At his news conference last night, President Bush made it clear that the United States will call for a vote on the Iraq resolution even if it appears certain the U.S. will lose. President Bush answered questions for about 40 minutes last night after outlining the U.S. case against Saddam Hussein in a 10-minute opening statement in the White House's East Room. Asked how his faith was guiding him through these deliberations, President Bush said: "I pray daily, I pray for guidance and wisdom and strength." He added that if he decides to send troops into war, "I would pray for their safety and I would pray for the safety of innocent Iraqi lives as well." Mr. Bush, appearing teary-eyed, said it was a "humbling experience" to know that people he's never met "have lifted me and my family up in prayer. It's been a comforting feeling to know that." Turning to another hot spot, the president said the best way to deal with rising tensions with North Korea is to involve other nations in the region, such as China, South Korea, Japan and Russia. "I think the best way to deal with this is in multilateral fashion by convincing those nations that they must stand up to their responsibilities, along with the United States, to convince Kim Jong Il that development of a nuclear arsenal is not in his nation's interests," said Mr. Bush. The White House news conference came as over 230,000 troops waited in locations near Iraq - with more on the way - all on standby for what they expect will be an order to go to war, most likely within a matter of days. "If we have to use force, I think a lot of nations will be with us," said President Bush. On the question of getting the backing of France and Germany, he added: "We have a disagreement... They're still our friends." Mr. Bush said he still hopes Saddam disarms or leaves Iraq on his own. The news conference was Mr. Bush's eighth as president, the first since Nov. 7 and his second in prime-time. He fields questions more routinely at other White House events. Among his plans for next week, President Bush is considering a major address to explain the justification and risks of military conflict, aides said. They say the speech could include a final ultimatum for Saddam and a warning to journalists and humanitarian workers to leave Iraq. Millions of anti-war demonstrators worldwide have protested against the Bush administration policies on Iraq. Polls show that most Americans support the Bush plan to disarm Iraq by force if needed. But many have serious reservations about war if the U.N. doesn't sign off on it. President Bush's overall approval rating has dipped during the Iraqi standoff.